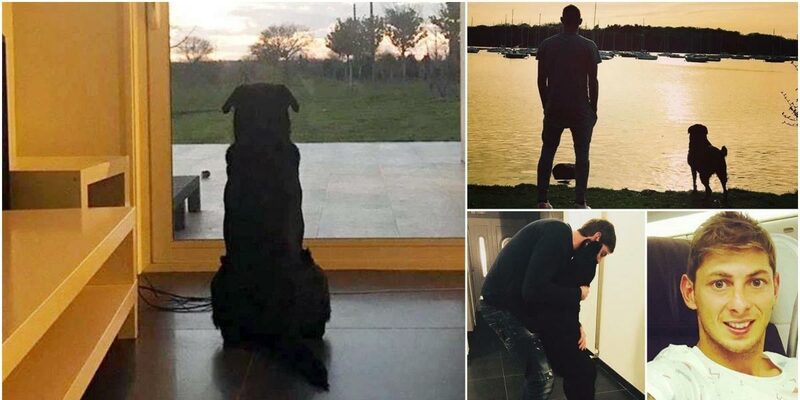 Romina Sala, sister of missing Cardiff striker Emiliano Sala, has posted heartbreaking images showing the tragic striker’s dog, Nala, awaiting the arrival the Argentine footballer, with the caption ‘Nala is waiting for you’. Romina, who lives in Santa Fe, Argentina, and has a young son, has transformed her Facebook page into a shrine to her brother since his disappearance. She posted the pictures at the weekend, showing loyal Nala staring off into the distance at the sky, seemingly hoping the tragic player would return any second. The post is made all the more heart-rending as it is believed Sala, 28, had traveled on the private Piper Malibu aircraft to say his goodbyes to close friends, including Nala, before linking up with his Cardiff City teammates for his first day of training following his club-record £15 million move from Nantes. Social media users were shattered by the images, and posted their own tributes to a tragic tale in football. Sala had plans to later arrange transport to the Welsh capital for Nala, who he rescued from an animal shelter and would regularly walk the Labrador in the vineyards of French town Carquefou, north of Nantes, which he had made his home. The 28-year-old himself had expressed his love for his pet on Instagram, calling Nala the “new member” and his “faithful companion” in 2015. Sadly, those plans never came to fruition. On Sunday, wreckage of the plane was found around 63 meters underwater in the English Channel off Guernsey, two weeks after it had lost contact with the coastguard. A day later, Air Live reported that, following an investigation by the Air Accidents Investigation Branch (AAIB), video footage showed a body present within the plane’s wreckage, belonging to one of the the plane’s crew, which consisted of Sala and the aircraft’s pilot, David Ibbotson.